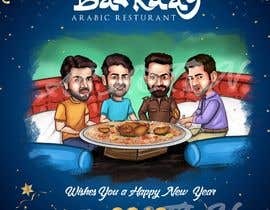 we are running a restaurant, "Barkaas Arabic Restaurant" which is of Arabian cuisine in which people sit down on a mattress, and all eat in a big single plate placed in between them. The plate is filled with rice and grilled chicken on it. 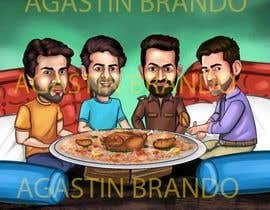 Last year we made a caricature of our local politicians eating mandi, and it was a success of our marketing. For this new year we wish to have a caricature of our local actors. so we need a caricature of four actors, similar or better to the caricature we made last year. their pictures are sent, but for other view of them, you can search in google by their names. Last year the caricature we made was copied by many, so if any logo can be included on shirts or somewhere, which cannot be easily removed.. it will be better. is target audiences are from INDIA?The resturant belongs from which country?